I’ll be hosting a webinar on Wednesday, March 12th, reviewing the results of a major survey LinkedIn recently conducted on employee satisfaction and its impact on job-seeking behavior. As expected, my interpretation differs greatly from how most people would interpret the same information. Just because someone is highly satisfied, doesn’t mean the person can’t be recruited. The use of job descriptions listing skills, duties, competencies, academics and experience requirements is a waste of time. Attracting the best and most highly satisfied people requires a basic understanding of what motivates people to excel. The person who contacts the prospect first is the most important person in the recruiting chain of event. I’ll use this post to set the stage for the webinar. It starts by recognizing that time is an employee’s most valuable asset. The best people use time more wisely than others for maximizing their personal growth and development. This same concept can be used to better understand why some people are passive job seekers and others more active. The Career Zone model shown in the graphic tracks changes in employee satisfaction over time from high growth on the left, flattening in the middle, and declining on the right. By figuring out where on the Career Zone curve your ideal candidate is likely to fall, a recruiter is in a stronger position to offer a more attractive opportunity. Much of this involves demonstrating how the prospect can better maximize his or her use of time by changing jobs for the right reasons. Zone I consists of Super Passive candidates. These people are highly satisfied, currently making a significant impact, and not looking to make a job change. 21% of the people responding to the survey categorized themselves as Super Passive. You need an extraordinary career move and extraordinary recruiter to attract those in Zone 1. Zone 2 is the domain of Explorers. These people are not looking, but due to a variety of circumstances are willing to consider other opportunities that represent significant career moves if contacted directly by a recruiter. 43% of the survey respondents in the US indicated that they were Explorers. To get their attention though, the recruiter must convince the prospect to focus on the long term aspects of the job, not the title, company, compensation or location. This is why first contact is so important. Zone 3 represents the Tiptoers. While not actively looking, Tiptoers have decided to leave and are quietly reaching out to their close personal network to discuss potential next moves. 13% of the respondents in the US indicated they were in this category. One of the best ways to find them is to make sure they contact one of your employees first. 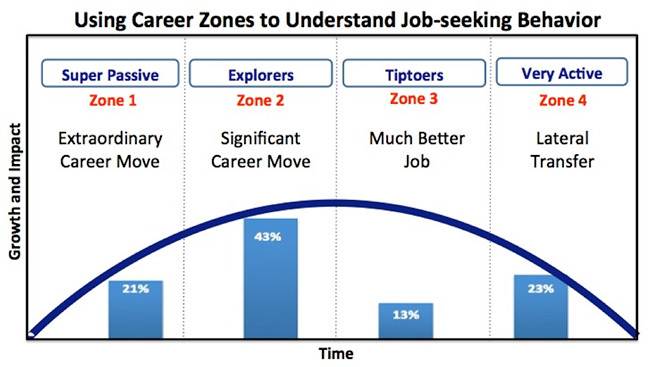 Zone 4 represents the Very Active job-seekers. They are using all sources to find another job similar to the one they now hold. While 23% of the workforce in the US is active, the best candidates are still going to be choosey, so you need to make sure your job postings are compelling and easy to find. As part of the Career Zone concept, and as part of the webcast, I’ll also dig into some interesting aspects of human nature and why people leave jobs and the criteria they use to accept offers. This information is essential to craft appropriate recruiting messages that excite the prospect to consider your opportunity. From what I’ve seen, too many recruiters emphasize short-term motivators (employer brand, compensation increases, generic boilerplate and hyperbole) to entice prospects to consider their job openings. When candidates use this information as the basis for accepting offers, especially when it’s made in comparison to their current jobs, any improvement in job satisfaction is likely to be short-lived. Instead it’s far better to attract and close passive candidates on their long-term intrinsic motivators focusing on what they’ll be doing and becoming, not what they’ll be getting on the start date. This is also how you maximize retention and performance. Equally important, it’s how you close candidates on career growth rather than compensation maximization. Changes in job satisfaction lead to fundamental changes in job-seeking behavior. The savvy talent leader and recruiter can use this information to better target their ideal prospects with appropriate messages and more effective recruiting techniques. As you’ll discover at the webinar, a better understanding of your ideal candidates can lead to major improvements in candidate quality and recruiter performance. 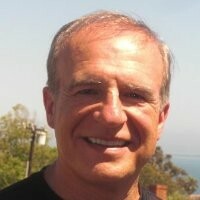 To hear Lou in action and learn how to attract the ideal candidate, sign up for tomorrow’s webinar.